Huge Competition: The dealer space faces huge competition and because of the nature of automobile business, unpredictability is the norm here. The products, if not sold at the right time, may become obsolete and can lead to huge losses. A large number of rising businesses and dealerships also threaten the business. Droom makes sure that once the products are listed with us, the maximum effort is made in pushing the vehicle in the market. Our marketing team makes all efforts to place your vehicle into the market all over the country, something which is not possible for an offline dealership. The whole process thereby brings players from across the country, and the goods can be sold to buyers, who might otherwise had have never heard of the dealership. Once the listing fee is paid, it becomes our job to make sure you get the best price for your vehicle. In this competitive landscape where organised retail is a threat for every dealer. 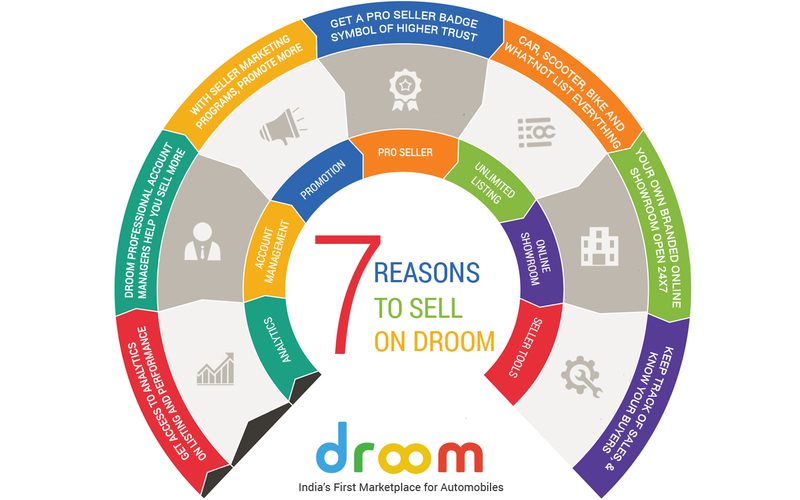 Droom Offers the sellers their own online showroom and helps in making the competition more even. Non committed Buyers: Another common cause of worry for the dealers are the authenticity and buying stage of the buyers, whether the buyers really are interested to buy the products or not. Droom, with its policy of buyer verification, has initiated the concept of commitment fee, where, once a buyer selects a vehicle for buying, has to pay 2% of the total selling price as the commitment fee, which ensures that the buyer is genuinely interested in the purchase and is not a fake buyer or a casual enquiry. Also, once the commitment fee is paid, the product is no longer displayed for sale, and is kept exclusively for the buyer, who can then come and check the machine as well as go for a testdrive. The commitment fee is one of the pillars of Droom’s Circle of Trust and is implemented to reduce seller pain-points. Delay in Payment: Another major pain-point for dealers and sellers is the amount payable and when that will be paid by buyers. Most dealers complain of delayed payments and the difficulties they face during the whole transaction, but, we, at Droom, make sure that this pain point is reduced as much as possible. First and foremost, Droom provides sellers with account managers, who help in selling more stuff online, as well as help the sellers in getting the best offer price for their vehicles online. We, at Droom, also provide access to analysis on the listings and prices, which in turn helps the seller in getting the product most in demand at the best prices. Also, once the commitment fee is paid by the buyer, the vehicle is exclusively kept aside for him, but the buyer has to pay the remainder of the amount within 5 days, failing which, the product is again put up for sale. In this way, the seller does not have to worry about the product not getting enough exposure to the market. Transaction based fee model: The seller usually has to pay to the marketplace regardless of any transactions having taken place or not. But, we at Droom, make sure that the seller pays only when the transactions have taken place. We believe in performance based payment, which makes the seller instil more faith and trust in us, as well as makes us perform better, ultimately giving a better service to our clients. No Payments per listing: It’s a strict no-no with us at Droom. We allow unlimited listings and also process bulk listings for the products, once the listing fee is processed. Also, once the transaction is complete, Droom pays the seller a certain percentage of the initial commitment fee, which overall the end of the transaction, helps the seller in earning about 5% more than in the offline marketplace. Droom is committed in making the automobile market more efficient and pain-free. We are, and will always work hard to make the whole process of buying and selling used vehicles online more user-friendly and profitable. If you are facing one or all of the above pain points, then register with Droom today, and earn more from the transactions than your counterparts. Visit droom.in for more info. Road Side Assistance Now Available on Droom!